The 'Username' is your student number as it appears on your student ID card. Your password is same as your MYWAI student portal password. Using the example Username above. This is the first step in accessing your mailbox. How to forward your student email to your personal email? Note: The following instructions will only work on a Mac or a PC. We recommend you to use a PC or a Mac when you try these instructions. 3. 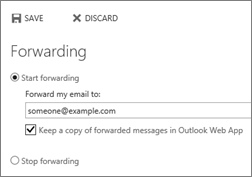 Select Start forwarding, enter the email address you want, set or clear the Keep a copy of forwarded messages in Outlook Web App check box, and then select Save.